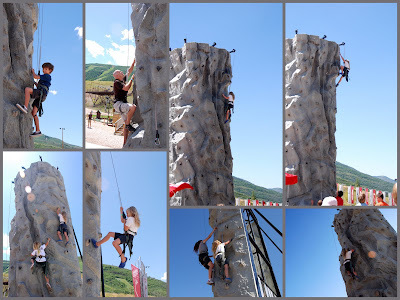 Before Tom and Anne headed back to Malibu with the kids, I took a day off and we played at the Park City Mountain Resort. We had our choice between Park City or Lagoon. I am SO glad we went to the mountains. Everyone had a blast, got sunburned and tried something new. 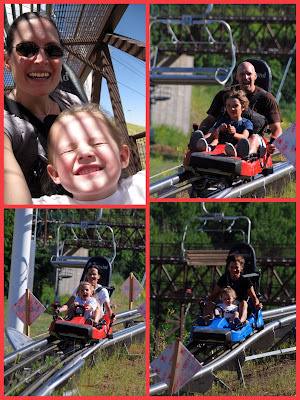 We did the all day pass, so we had unlimited rides on the Alpine Slide, the Alpine Coaster, the Zip Line, the trampoline, the rock wall, the miniature golf, the kiddie rides and the maze. I would love to make the resort an annual tradition. (We went last year with my work and loved it then too, but it was chilly then and Ivy was too young to do much). 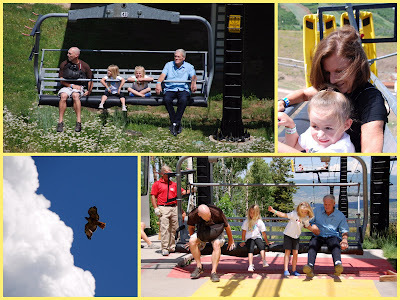 On the lift we saw cute kids and a hawk. On the ground we watched kids (Jade) climb to the top and hit the button that didn't work. I even raced her to the top, once. 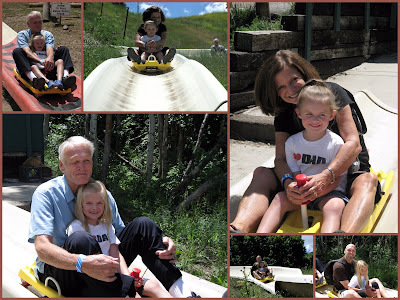 On the mountain, we challenged each other to the fastest rides down the alpine slide. I knew I'd lose since I stopped to snap some pictures with my broken point and shoot. Grandma was nearly thrown from the coaster as her seat belt loosened going around a corner and everyone else pushed on the levers to go as fast as they possibly could. 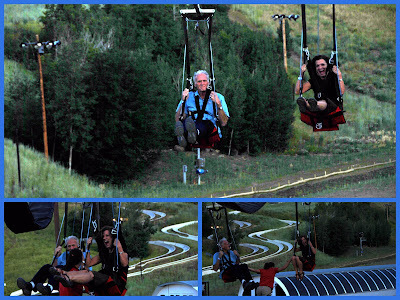 From the tree tops, the older and heavier family members floated to the base of the mountain with surprising speed. After our first time down, we found out that to go faster you need to tuck into as small of a ball as you possibly can. We tried it and boy do you zoom through the trees at a scary speed. If you need an activity to end your summer with, this is the one to do. It isn't cheap, but if you get the all day pass, you really get to enjoy your day more. There is nothing more annoying than using your one trip down the coaster with the expectation of racing down the mountain only to find yourself stopping at every turn because the person in front of you has a scared child with them. (Wow, that was a run on sentence!) It happens- believe me, I know. So, I was really glad I got to go again to redeem the ride.